Some of the responses included “…to become an advocate for the state, speaking up for health and people with disabilities”, “…of becoming a Broadway producer”, and …”of becoming a veterinarian assistant”. Jasmine’s own dream was to attend law school to become a lawyer. While Jasmine admits that certain parts of the project were exhausting, she enjoyed putting the “What is Your Dream?” project together in honor of Martin Luther King Jr. Day and Black History Month at DSC. 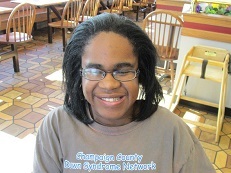 In her free time Jasmine enjoys spending time with her friends and family and is a member of the Self-Advocates group at DSC. Some of Jasmine’s favorite pastimes include singing, watching Empire on Netflix and surfing YouTube. Jasmine also enjoys fashion and listening to different kinds of music.